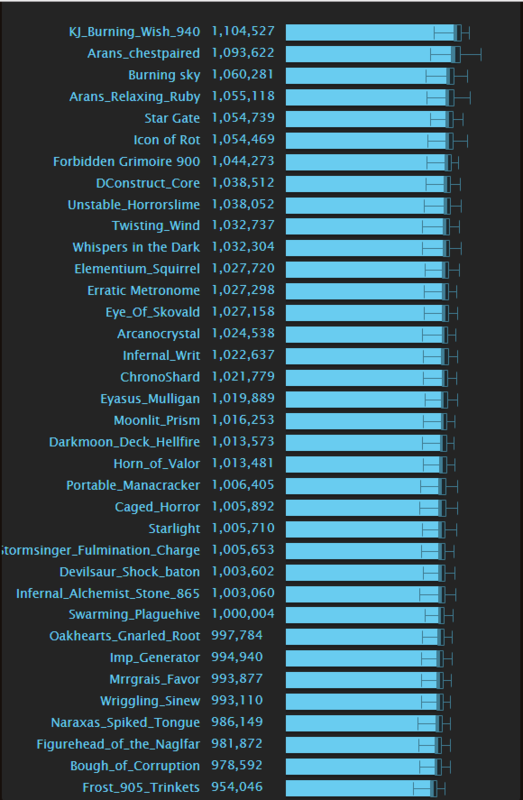 [7.2] Frost Talents, Trinkets, Racials, Stats, Legendary - Altered Time - your #1 World of Warcraft Mage resource! 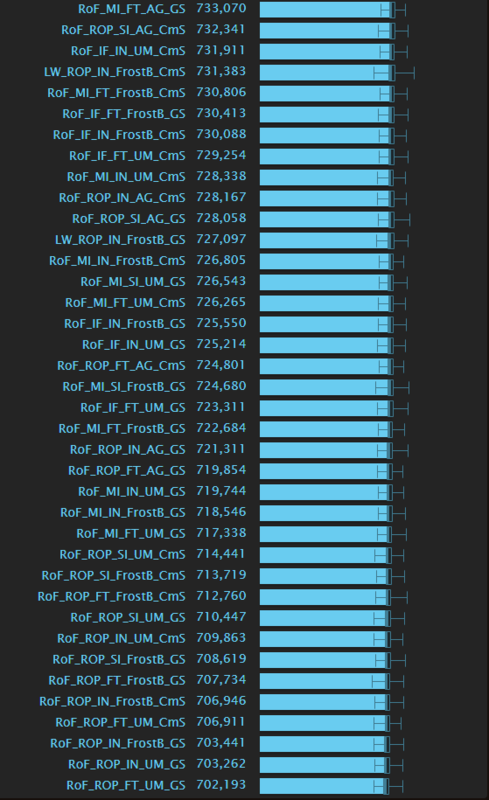 Below I've put together some basic information for people derived from SimC runs to help guide mages choices on how they want to play Frost mage. 2) What's going on with Stat Weights? 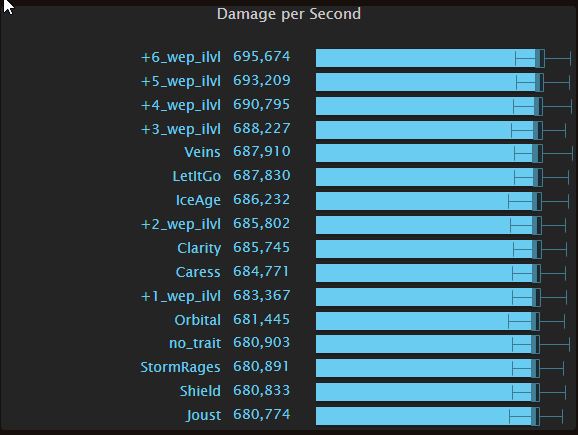 Crit value has been raised significantly by the 7.1.5 buffs. As a result, it's valued highly over haste/int until you reach the shatter cap (~33%). After that, Crit declines sharply in value. Here are weights right after the shatter cap. Crit has declined an Haste has taken over. However, haste does not remain the best stat. 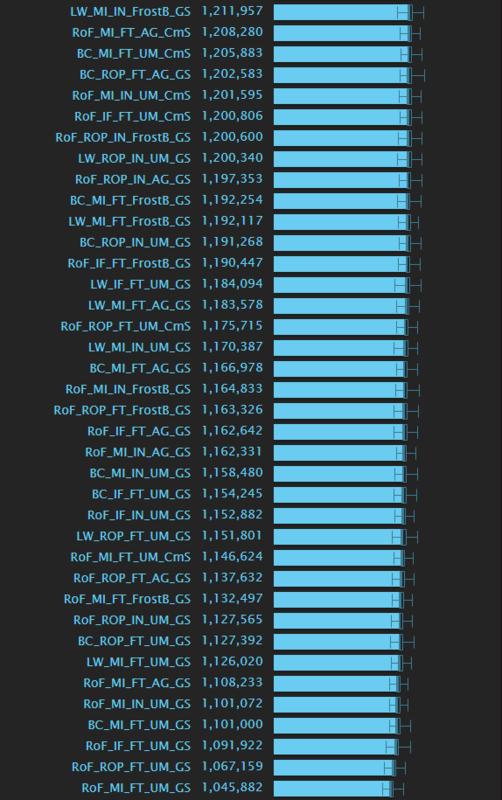 Because of large haste procs that are available in NH (Whispers/Metronome), Frost actually beings to GCD cap (100% haste) and FB cast time cap (166% haste) often enough for us to see a slow lowering of haste value as we add more haste. We're encountering haste DRing itself as the %time spend GCD/FBcast time increases with haste. As we can see, haste is going lower and lower, and will eventually be passed by Vers. If we continuing to gain haste. 3) How do I use Freezing Rain? Do I blizzard on ST? Use it on >1 target, not on Single Target. Last edited by Frosted on Mon Mar 27, 2017 6:42 pm, edited 21 times in total. Thanks Frosted. Was this data after the hotfix frost buffs yesterday? The Purpose of this post is to provide some guidance to commonly asked questions regarding to gearing. What is presented would best be called rules of thumb. For your specific gear situation - You will most likely need to sim yourself. All Sims in this post were done with the same set of gear used by Frosted in the above post - Thus these rules are really only valid for the 840~ item level range. 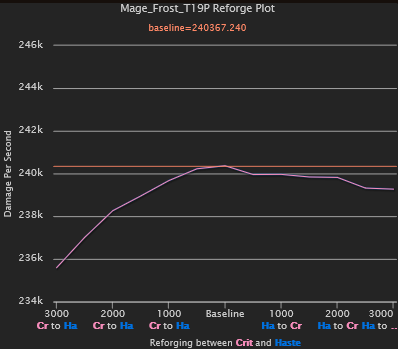 This image is a reforge Plot, swapping between crit and haste of the default frost profile. 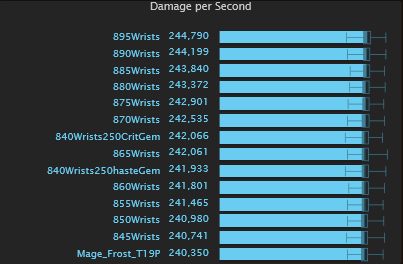 It shows the approximate DPS change if you where, for example, swap the default haste enchants to crit and so on. What is being demonstrated is that there exists a Local Maxima for this gear set with a ratio of approx. 5566 Crit to 9800 haste. The location of this local max, has in my experience change gear-set to gear-set. So bringing it home / what does this mean? 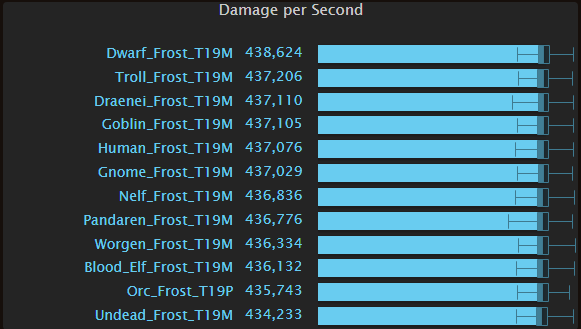 1) At any given time either crit or haste will be your best stat as frost, depending on your gear. Question: Approximately How many item levels is a socket worth on a piece of gear? Of these sub categories, trinkets are to complicated to deal with so "sim yourself". Each trinket scales slightly differently with item level so a rule of thumb is impractical. None of the Comet Storm profiles actually use Comet Storm, this shouldn't affect the top places of single target rankings that much, but it's a big deal on AoE. 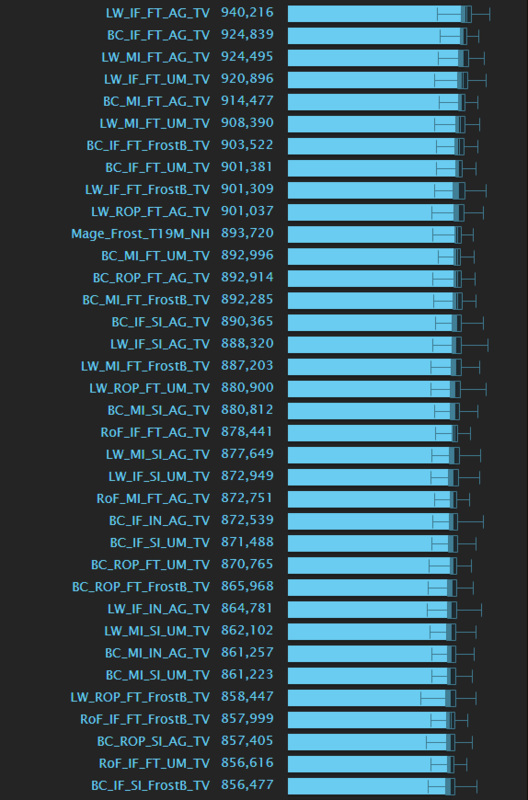 Especially considering that most of the TV profiles just run out of mana. will TW at pull and then the mage receives another raid Bloodlust regardless. 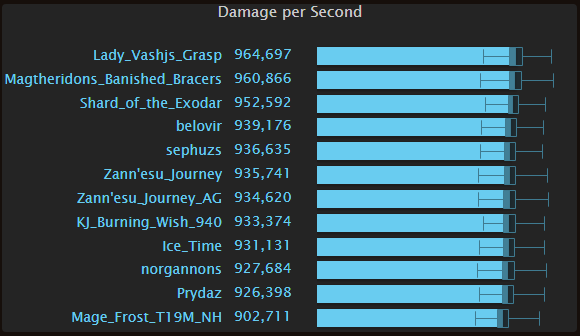 Just by looking at the cast times, everything during Bloodlust + SotE TW is 69% faster. In game, they don't stack. Casting SotE TW while Bloodlust is active just refreshes the duration to 40 sec, it doesn't give you second buff (same thing happens when you SotE TW first and then Bloodlust). works at the moment. It also produces nice dps boost, because even though Bloodlust and SotE TW stack in SimC, you waste a lot of the haste by going over GCD cap. I fixed the CmS issue. default_actions=1 should work now to generate a line to use it. I'll look into shard here shortly. I pushed a kind of hack-ish fix to this for the time being since legion is out like, now. I'll have to re-visit the problem of Bloodlust/Shard-lust when I have more time. But for the time being, just use the time>5 work around. Pulled and compiled, looks like everything works just fine. Cheers. I did some testing in regards to Zann'esu Journey. Doing it at lower stacks was slight dps loss (even with infinite mana to prevent Blizzard spam making you OOM). I compared it against "no Blizzard", Blizzard at 1+, 2+, 3+, 4+ and 5 stacks, but I sadly forgot to include "always Blizzard". Launch is around the door, so I can't redo the sims at the moment. It only confirm one things : Frost rely way too much on Finger of Frost. Lonely Winter don't work that good because it remove both control (survival) and FoF (damage). But as soon as Chilled to the core is unlock, Thermal Void build can't really compet as synnergy are too good. Im not sure if this is the right place to talk about this but I have 2 questions. the first is, I went towards the black ice path first and am heading towards chilled to the core. how boned am I for doing this? and second black ice only empowers icicles as they launch off so glacial spike cannot be affected by it right? So I probably do not want to be using GS in dungeons ? Black Ice states it empowers Icicles, increasing damage done by 100%. It doesn't necessarily state it only empowers extra icicles after you have 5 stored. If it empowers your stored icicles as well, then it would still greatly enhance GS. Does anyone have any clarification on how this trait works? The description isn't exactly 100% clear it does or doesn't effect GS. 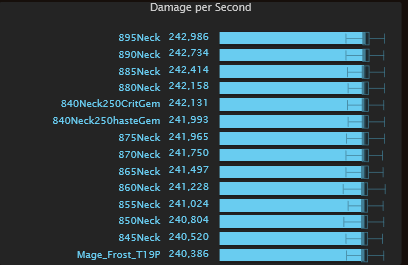 I've seen Black Ice increase damage from running dungeons where some Glacial Spikes from others are doing quite the different damage (heavy outliers on max hit compared to minimum damage), so it does seem to work perfectly fine. If it didn't Blizz would have done something like with "Lonely Winter" and "It's Cold Outside" I'm sure because that would be too obvious of a miss. On that note though, I'm guessing the sims for GS don't account for this or do they? And if they don't, how much better are they placed? On Black Ice : it's a must have. 1- empowered Icicle leave a black trail. 2- proc rate look around 20% (more?) as I have one or more with 5 Icicles. 3- it increase GS damage. On Survability: Ice Barrier is very tricky at 3/3. It's to the point that not having it up means dying quickly. And pack of small mob (tiny rat/spider) are as deadly as caster because of sad AoE damage. (Solo questing do no tank and Unstable Magic). Precasting Flurry instead Frostbolt with Bone Chilling. Even without, it can be good as it's a 3 hit spell. Better chance for trinket proc. How does the nerf to the Heirloom trinket affect it? I know it did well even if the target wasn't demon, but now it gives 500 less of every stat when it procs. I assume you should replace it with any mythic trinket you find now pretty much? (Too bad I've thrown away every since they simmed worse). It's a 2 in 1 questions. Against demon, the 10% damage increase is still pretty solid. In other case, it's only a 815 trinket. With a good timing, it can be possible to keep the buff at 6 stack form dropping but it require the 3rd charges from Icy Hands. The main idea is to always keep 1 charges of FoF active and to use it to refresh the buff duration. but it's not wot=rth casting an Ice Lance without FoF. Of course, it work better without Lonely Winter as it result in less FoF proc. 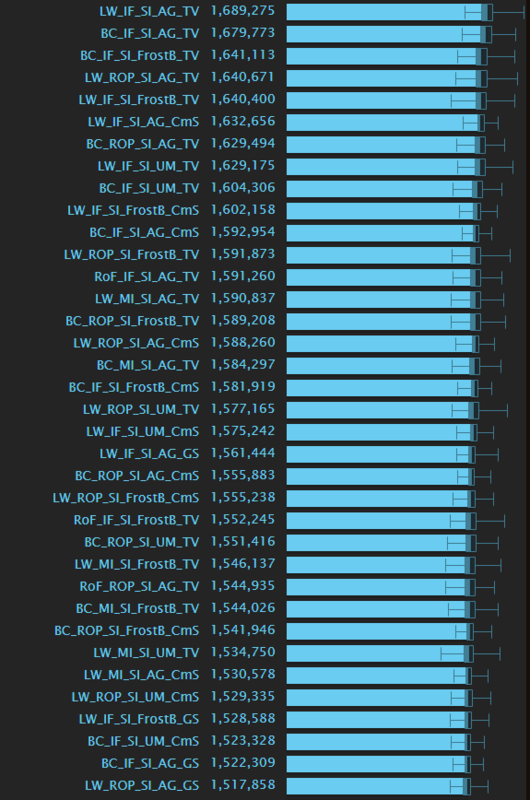 Inspired by the Dantalionax fight in BRH, I've been looking into versatility/damage buff breakpoints where the rotation 5x Frostbolt -> Glacial Spike starts to beat everything else. I think I have found a bug in SimC while doing that. It seems that Icicles do not properly benefit from versatility. 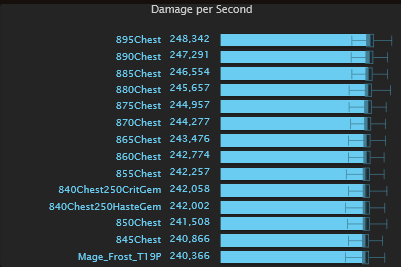 I checked in game to be sure and Glacial Spike indeed does its damage according to the "expected damage" calculation. edit: Whoops, I used confusing value for versatility. 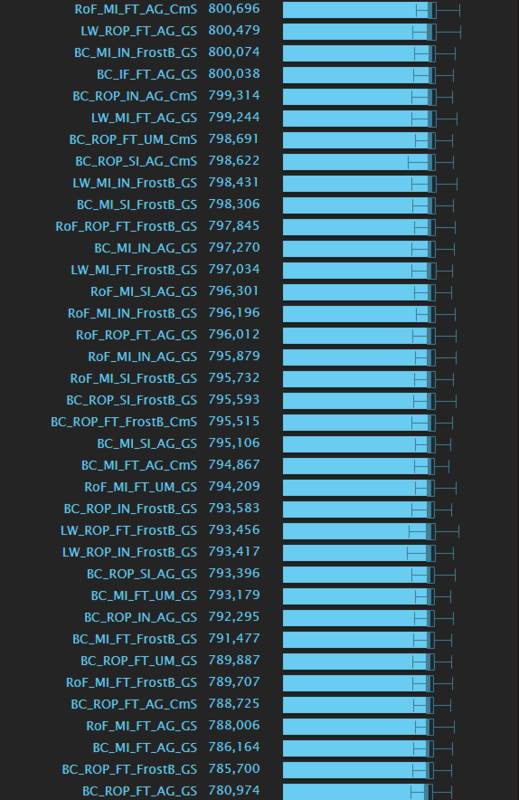 If both versatility and RoP give 50% bonus, it's hard to tell which is not working. Try with gear_versatility_rating=40000 and then it should be obvious that RoP is not the issue. 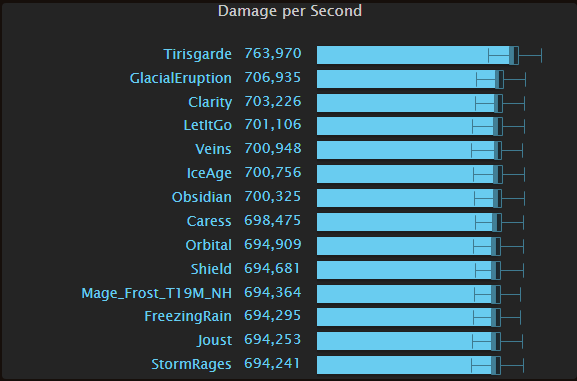 First 5 Frostbolts crit for ~120k, then versatility trinket is used and Icicles are fired via Ice Lance. First two hit for ~180k, which should be impossible with <100% mastery. 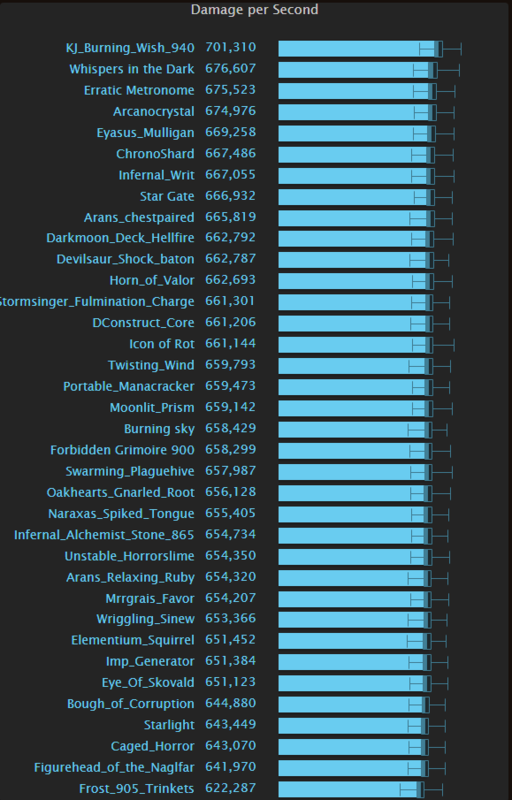 Added EN trinkets, updated things generally to Heroic Raid ilvl.